While I mostly agree with that conclusion, I have a different perspective because I am considering this question from a different point-of-view, which is that of a naturopathic doctor. This means that I want to understand the root cause of a symptom or disease and find a solution for the individual patient that will help her thrive in both the short and long run. Is the drug directly toxic to my body? Are there serious short-term side effects from the drug? Are there long-term side effects from the drug? Does this drug or intervention address the root cause(s) of the issue? If I choose this route, will the underlying issues be ignored or covered up? What are the repercussions of not treating the underlying cause and how will this impact my health in the long run? Could there be additional benefits of choosing another approach to treatment? 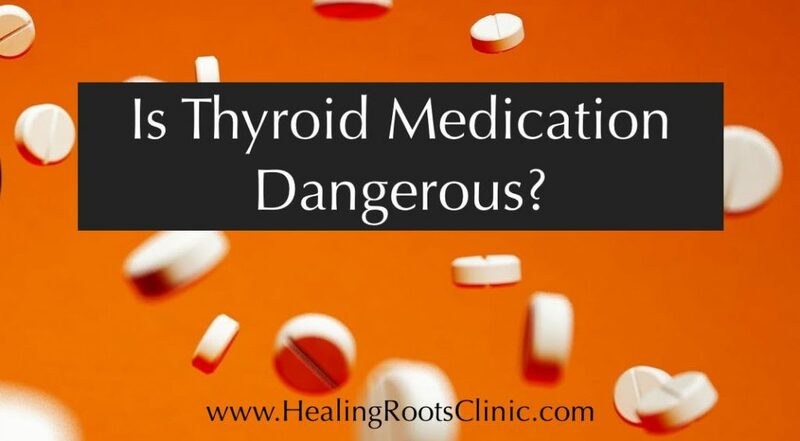 I want to focus primarily on this latter set of questions, but I do think it is important to briefly address the first three and understand why it is correct to say that thyroid medication is not dangerous. The majority of these symptoms are not so much caused by the medication itself but from incorrect dosing of the medication. Compare these to a list of hyperthyroid symptoms and you will notice a lot of overlap. By and large, the medication itself is pretty safe as long as dosing is dialed in (although, from my perspective, thyroid medication can probably never be dosed perfectly because it involves trying to give a static amount of a hormone that naturally fluctuates through any given day). There are people who respond better to various kinds of thyroid medication than others, for instance, a synthetic drug like Synthroid or a natural derivative like Nature Throid or Armour. 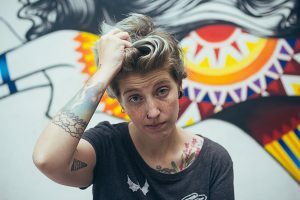 Other than the issue of over-medicating, the major “danger” with thyroid medications is that people can experience an allergic or hypersensitivity reaction to the fillers in the medication. Fillers in Synthroid include corn starch, confectioners sugar, lactose, magnesium stearate, povidone, talc, and color additives. Fillers in Cytomel contain calcium sulfate, gelatin, corn starch, stearic acid, sucrose, and talc. Gluten has also been used as a filler in some brands and compounded products. This issue is easily avoidable by confirming with your pharmacist that the medication is free of substances that you are sensitive or allergic too. being informed about the repercussions of not treating it. The first is that my practice is filled with people who sought out my care because they did not feel better on thyroid medication or because, over time, they developed other symptoms of chronic disease, including additional autoimmune issues. This suggests that thyroid medication alone did not treat the underlying cause or help the individual become healthier on the whole despite normal TSH levels. The second comes from looking at the underlying causes of thyroid disease and considering the other conditions related to these causes that may, and quite often do, develop (which is coming up in the next blog post). I want to use a short example that I share with most patients to drive home the importance of treating the underlying cause rather than the symptom. This example may seem like it is singling out conventional medicine, but you can absolutely choose therapies that are from nature or considered natural but also only address the symptom rather than the root cause. A small example is the use of coconut oil topically for eczema. This doesn’t address an underlying cause either. It is true that there is no chance of creating a cycle of severe addiction and lashback from the skin, as can happen in topical corticosteroid addiction, but coconut oil is also unlikely to be effective at all in controlling severe cases of eczema. In both the example of eczema and our main topic of conversation here, thyroid conditions, we are really looking at a symptom that something is wrong rather than the problem. I have used the analogy of a smoke detector in the past and it is appropriate to remember it here. Your thyroid is like your body’s smoke detector. When it is “beeping” with signs like a swollen thyroid or high TSH, or symptoms like hair loss, weight gain, cold hands, or fatigue (and more), it is a sign that something is wrong in your body. Would you ever pop the batteries out of your smoke detector without investigating what set it off? That would be dangerous, right? 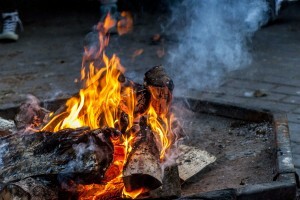 It might not burn the house down today or tomorrow, but something as small as smoldering ashes cause issues at some point in the long run. I wrote a 7-part blog series on the basics of thyroid health and the causes of thyroid disease. I would love to hear what you have to say about your experience with thyroid medication and interventions in the comment section. Please inspire each other! As a registered Naturopathic Doctor in the state of Colorado, I specialize in addressing the underlying issues related to thyroid, autoimmunity, digestion, chronic congestion, and adult acne. If you’re interested in working with me locally or via Skype/phone consultations, schedule a free “Is this a good fit?” office or phone consult so that you can find out how I can help you. 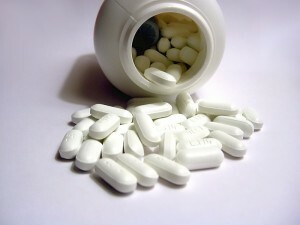 5 Responses to Is Thyroid Medication Dangerous? I am a 40ish female who has suffered with Graves disease and Graves Eye disease for the last 2 .5 years. I recently made the decision to have my thyroid removed after trying desperately for the last 2 years to heal my condition naturally on my own. VERY tough decision! And honestly not the one I was hoping for. My thyroid had grown up my neck and into my ear canal and was prohibiting swallowing and airway. I am 5 mos post surgery and have been on NDT hormone therapy, but still feeling very hypothyroid. Do you treat post thyroidectomy patients? Many thanks. That is a tough decision but sometimes a necessary one! Yes, I do work with post thyroidectomy patients- there are many possible explanations for continuing to feel hypothyroid. Hi there, I came to Dr. Enos last year with some very serious thyroid problems. I too went the natural route and tried healing it myself. Nothing helped. I decided to work with Dr. Enos after interviewing a dozen other NDs. She was a great fit and after about 6 months, I was able to come off my thyroid meds (something my endocrinologist said would NEVER happen!) I feel great and have learned SO much from her. I would highly recommend visiting her for your thyroid issues. So glad to hear that! Thanks for inspiring others with your success story. This entry was posted in Natural Medicine, Supplements, Thyroid and tagged Autoimmune Thyroid Denver Colorado, Graves Disease Denver Colorado, Hashimotos Denver Colorado, natural medicine denver colorado, naturopath doctor denver colorado, Naturopath Thyroid Denver Colorado, Thyroid Disease Denver Colorado, thyroid medication, thyroid medication dangerous. Bookmark the permalink.